It's grilling season! We love grilling practically year round, which is saying something for Minnesota, but now that summer is officially here (Memorial Day is the official start in our neck of the woods)we can really put that grill to use. My family LOVES ribs. And while I've always made the boneless country-style ribs in the crock pot, there are members of my clan who love their baby back ribs. I've tried a few ways to make these, and this is my favorite. 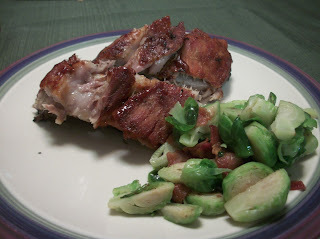 Ribs are cooked for many hours at a low heat in the oven, and then finished on the grill for that nice crunchy texture. They practically fall off the bone. Delicious. The secret for both texture and flavor is that the ribs sit on a "shelf" of onions - water below helps steam the meat but the meat doesn't sit in the liquid. The only hard part about this recipe is enduring the tantalizing aroma from the oven and knowing you have to wait several hours to eat! If it's pouring rain, or you want ribs in the middle of a snow storm, don't worry. You can also finish these in the oven. Either way, they are absolutely scrumptious. Get more great ideas at Full Plate, Hearth and Soul, What's Cooking, Wow Me, Wow Us, Foodie Friday. Season both sides of ribs liberally with salt, pepper, garlic and paprika; set aside. Slice onions into 1/2" rings and place them in the bottom of a large roasting pan (or two smaller ones – use whatever you need so that the ribs can cook in a single layer). This is to create a layer that will keep the ribs elevated so that they’re never sitting in liquid. Pour just enough beer or water into the pan to cover the bottom. Add liquid smoke to the beer. Arrange rib racks in a single layer on top of onion slices. Cover pan tightly with two layers of aluminum foil. Bake at 300 degrees for 4 hours. Remove ribs from oven and uncover. 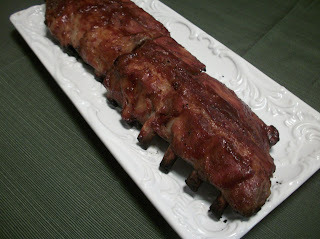 Your St. Louis Baby Back Ribs look fabulous! Thanks so much for sharing with Full Plate Thursday and have a great weekend! 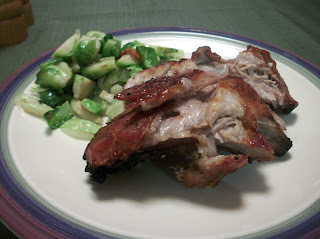 Your Baby Back Ribs look and sound delicious, Sara! My late Dad always cooked baby back ribs on a shelf of onions too, although his recipe was slightly different to yours. I agree, starting them in the oven and finishing them on the grill is definitely the way to go. Thank you for sharing this seriously tasty recipe with us at the Hearth and Soul Hop.